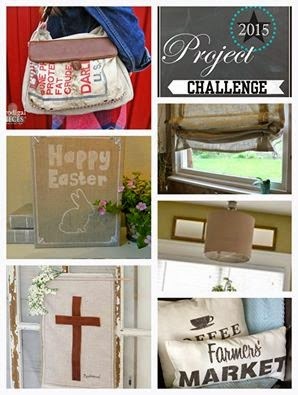 Hello my lovely friends, I'm so excited to be participating in round 3 of project challenge! The best part about it, is this time it's a LINKY PARTY too!! Yes, you get to participate along with us and share your projects on all six blogs! So what is project challenge? Every month we will be given a type of material to work with and have to create something with it, so at the end of this post, add an existing post you have or get busy creating a project using Linen and/or Leather and come back here to show it off. We can't wait to see what you come up with! So, are ya ready to see mine? It was so hard to choose. Not because I didn't know what to do with the materials, but I couldn't decide which project to do for the challenge, so next week I'll be sharing a couple more projects using linen and/or leather, you'll just have to come back to see what they are. The one I want to share with you today is one I've been wanting to do for quite awhile and haven't had a good excuse to take the time to do. This kitchen window has been a challenge. I know. Boring, huh? I've switched it up SO many times, but with the same results. 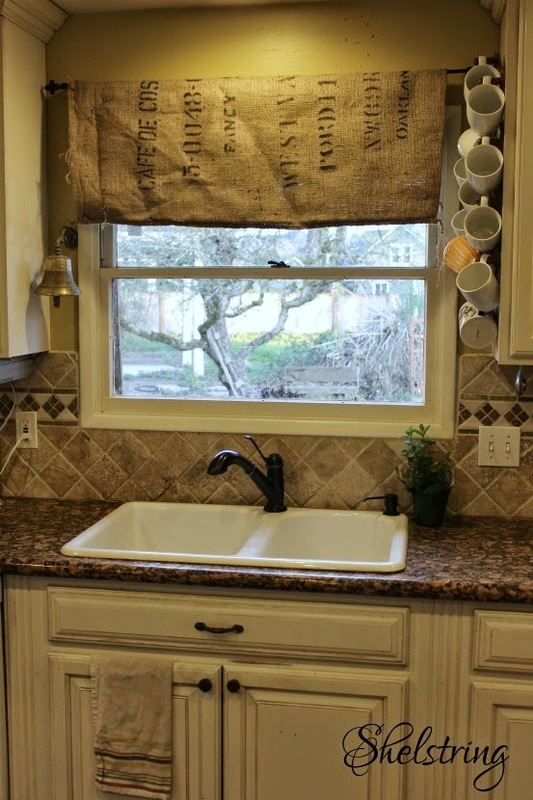 I recently just made roman shades for my neighbors french doors (more on that later---I promise!) and realized that was the perfect solution here! 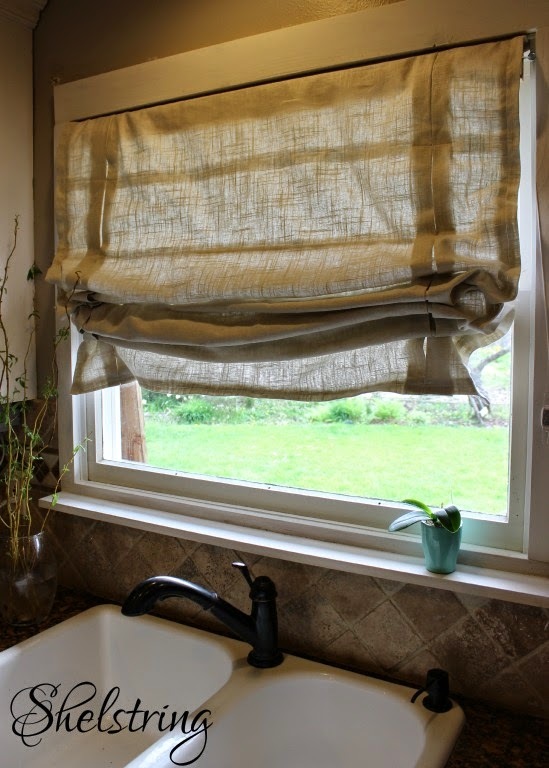 Going without a window treatment at all is just not an option since the sunlight glares in at certain times of the day. 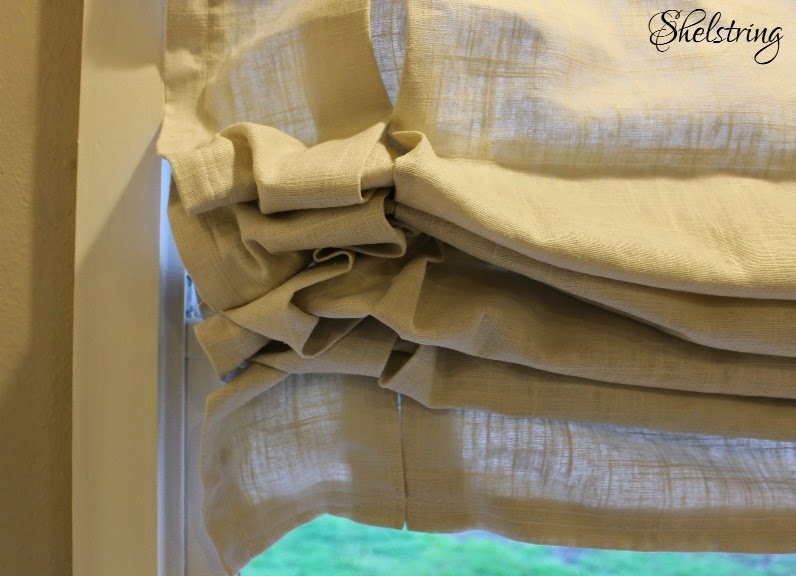 Something adjustable is the best answer, since I like to have my window open and bright, yet hate to have the sun in my eyes. Great! 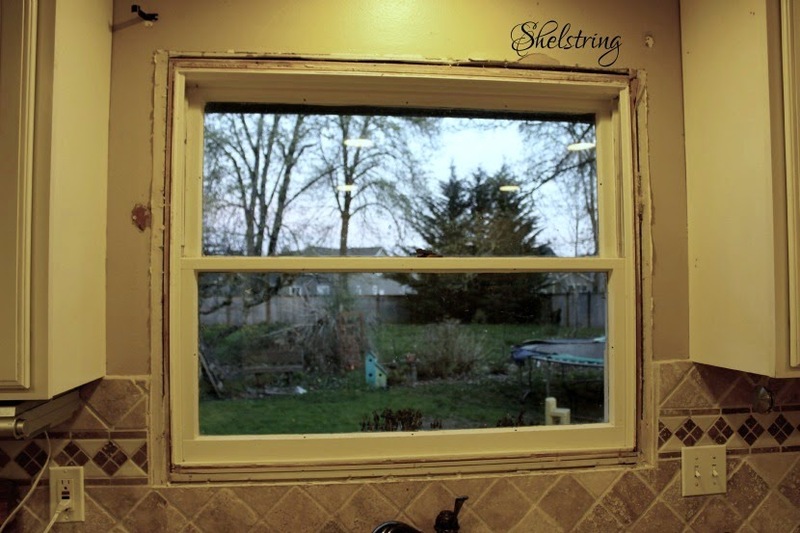 Have a solution, yet couldn't bare to put another new treatment on that awful window. The trim was such an eye sore. I've done this before, so no big deal, but this time I was working around tile and wanted a ledge. I've been without one for 9 years. Time to do something about it, right? So I added a ledge and made my roman shades. 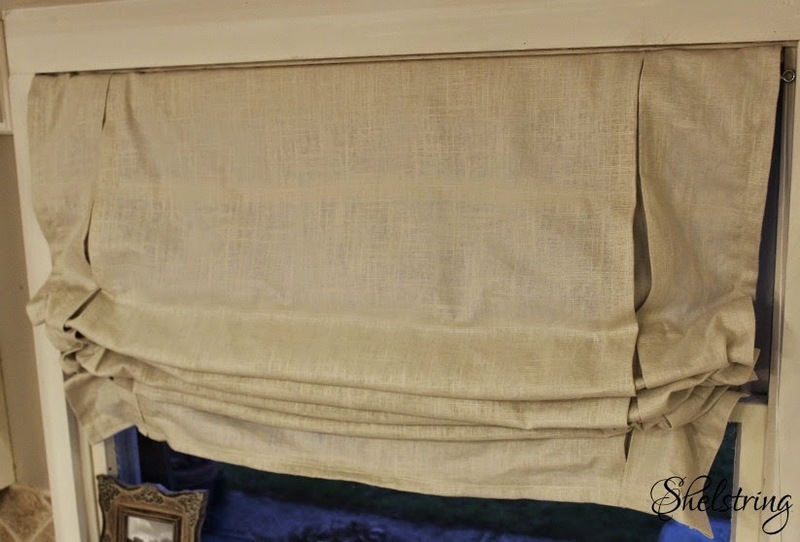 I loved this picture I found on Pinterest so I used it as inspiration and made a simple pleated shade. I love how it bunches and gathers when it's lifted and causes what I call a "blooming effect". 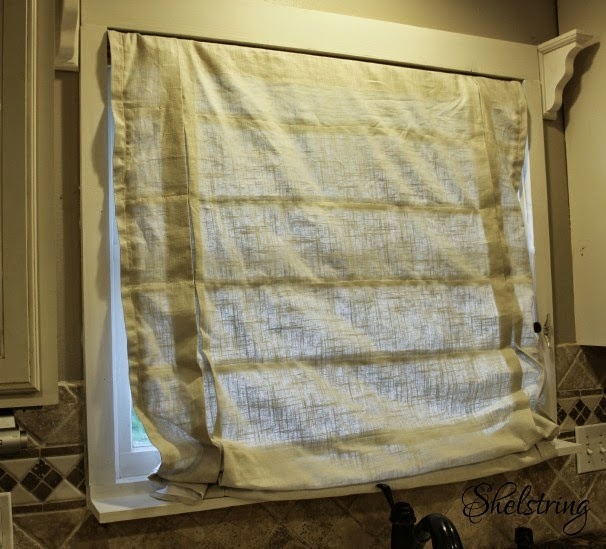 I made the shade longer than the window because I like the look and wanted more bunching when it is pulled up. The ledge helps keep it from being in the way of the faucet. I don't really plan on the shade being all the way down very often, so it doesn't really matter, but it was an added bonus to having added the ledge. In the above photo you can see that I kept the pleats sewn closed. Later I decided to take them out so they could spread a little more. I really like the way it turned out, but have yet to let out the bottom of the pleats. So I added a shelf. 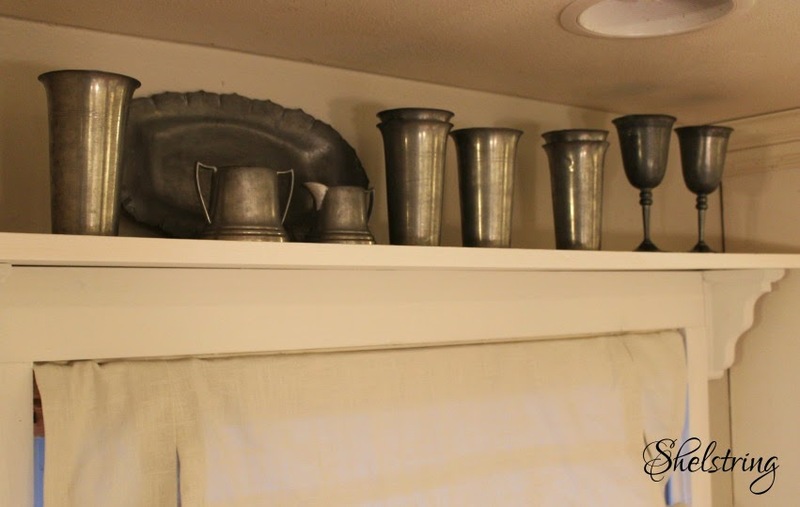 It's the perfect place to hold the pewter I inherited from my Grammy. I remember these displayed on a ledge surrounding her dining room when I was growing up. Some sweet memories. I'm looking forward to all the ways I can switch up my new added spaces. NOW, I'm satisfied. 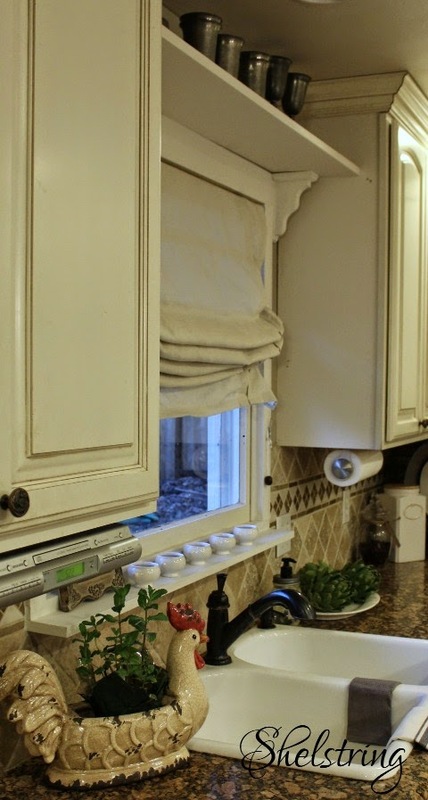 Doesn't the window treatment look more classy now? Now. What have you got to share? 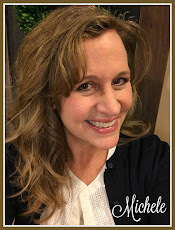 Link up all those wonderful projects you have made with linen and leather below, and if you need more inspiring ideas, or even if you don't, check out the other wonderful projects below, and remember courtesy begats courtesy and sweet comments make everyone's day a little brighter! Awesome! 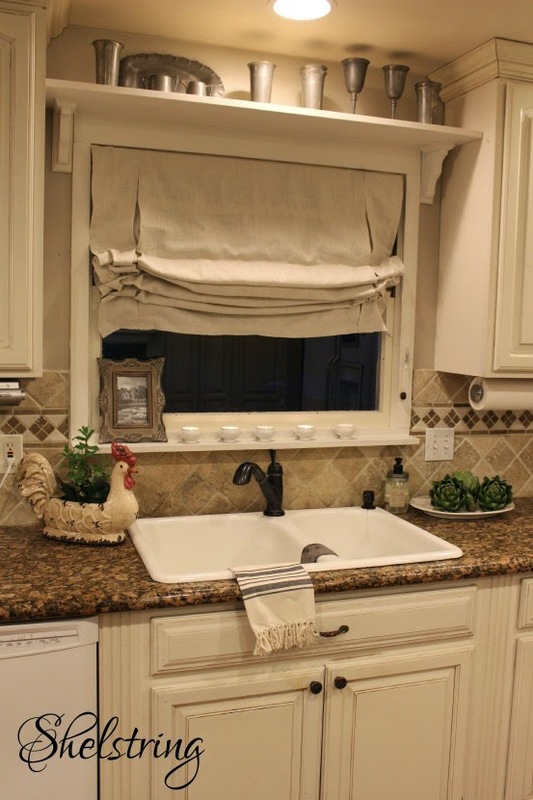 I love how your window turned out and Roman shades are my fav! Super cute MIchele. I like the lightness of linen for spring. That is so cute that the neighbor kid even noticed! Your shade is so beautiful! I just love how nice and full it is! The whole window area looks awesome! Love that you added that shelf and that linen shade is fantastic! Great job, Michelle! Nice job--i love the pleats!